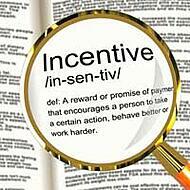 Incentive Programs for employees are used by management to encourage and reward specific actions. A properly run program can provide just the help a company needs. Do you need Employee Incentives, or Employee Recognition? They are NOT the same, yet many use these terms interchangeably. To be sure you are implementing the right employee incentive program to meet your objectives, see this Definition of Incentives vs Recognition. Others include Sales Contests, and Points-based Employee Incentive programs. These effective incentive programs are designed to change employee behaviors by continually offering incentives to motivate employees and rewards for improved performance. Enhanced employee performance is directly related to their receiving constant positive feedback. When positive feedback is provided, your employee recognition program becomes a powerfully motivating tool that builds morale, increases productivity, and improves employee engagement levels. Have a Vision for your business. Have an image in your mind of the expected future of your business. Having a vision will not only inspire you, but will help you inspire others to reach for the same goal. See this great resource showing how to re-write your company's future. Will it be an Employee Incentive Program, a Recognition Program, or a combination of both? Define the rules - if points are to be used, how are points earned? Note: Employees will only be motivated when they feel they can actually attain your goals. - Who sets initial budget, and tracks the program’s status to budget? Give your incentive program for employees a name and define its theme. Develop an exciting promotional campaign for the launch of your new employee incentive program just as you would for an actual product launch. You’ll want to capture the imagination of your employees. Explain your objectives, and rewards for their success. Once employees are shown how they can make a difference, they'll do it! Communicate often. The most successful companies make a big deal about their winners and awards (points, etc). Make them feel special and others will notice. Let participants or teams know their current standings in the employee recognition program. If appropriate, even chart their progress on employee bulletin boards. Research and experience clearly indicate that merchandise awards are much more successful than money as employee incentive awards. Merchandise awards provide a continuous, long-lasting reminder of ones success, every time the award is seen or used. Also, cash awards are taxable, while tangible merchandise used in formal employee recognition programs and safety programs, usually are not taxable. Please contact your tax advisor for guidance with your program. See: Cash or Merchandise awards - what works best. As a general guideline – over a 12 month period a participant of any incentive program for employees should be able to earn between 1% and 5% of their gross salary for sufficient motivation. The above is based on industry guidelines. However, each employee incentive or recognition program is built based on your unique business objectives, challenges, opportunities, and budget. Without Effective Employee Incentive / Recognition Programs, you will never fully optimize your employee’s potential and your company’s potential. The most successful programs are the result of an ongoing process. For the best long term performance increases, plan to periodically adjust and improve your employee recognition program. If you’re looking for a way to implement a cost-effective employee incentive program that will also help improve your bottom line, please contact us today. Let us help you develop your next employee incentive program. cost-effective way to boost employee performance. See our many Employee Recognition Solutions. Your corporate recognition components should all work together to motivate and increase performance through better engagement.